It’s hard to believe that KesselRun Corporate Travel Solutions has just passed its 16-year anniversary. Over the years we have worked with scores of organizations, both in the private and public sectors, spanning every industry and size. We’ve seen and done just about it all – supplier benchmarking, negotiations, client advocacy, risk, expense – and have been fortunate to work with many amazing and smart clients (some, admittedly, more challenging than others). Through 16 years supporting our client engagements, we have utilized many cutting-edge technology solutions and have considered investing in some of these solutions as an organization. While so much of the third-party technology available to the corporate travel industry impresses and innovates, we never felt compelled to act… until now. If there is one axiom in corporate travel, it is this: no matter the client size, industry, whether traditionally managed via a Travel Management Company (TMC) or unmanaged, the greatest opportunity to save money, leverage spend, and mitigate risk is to capture all possible booking data, regardless of source, in a timely, meaningful and actionable manner. Why? In KesselRun’s experience, even the best-managed travel programs suffer from some degree of program leakage, and the bigger the client, often the more difficult to realize opportunity. Certainly, among those organizations that have no formal program in place, the ability to capture meaningful travel data in a utilizable way is nearly impossible, particularly when travelers are booking through myriad avenues. Since program opportunity typically lies within the existing spend base, the trick to program optimization is capturing and leveraging that spend data. “Would it be possible to capture a traveler’s booking data no matter the source (TMC, supplier site, or aggregator) in a way as to pose no security threat through the use of spyware or other potential malicious software, be implemented in an hour, be simple to use (keeping in mind that many of our clients may be over-burdened category managers who may or may not be corporate travel experts), and be inexpensive?” This was the central question I posed internally to our Managing Partner, Michael Brennan and our VP of Client Services, Krissy Herman. I also posed the question to a good friend of mine, technology guru, Nick Romano, formerly President of SignUp4, in the meetings management space. Two years later, in late Q4 2018, the four of us launched Capture Travel, Inc. We call it CapTrav. To date, response to CapTrav has been overwhelming and entirely satisfying. CapTrav is providing insight into an organization’s spend unprecedented in our experience. By automatically gathering all travel-related confirmation emails and post travel eFolio data, CapTrav can parse, assemble, benchmark data, and provide analytics with corporate travel optimization in mind. So, KesselRun moves into 2019 in strategic partnership with CapTrav and, given significant change in the industry specific to distribution and corporate booking habits, an incredible opportunity to provide additional value to managed travel programs; and perhaps introduce a new and smarter way to manage this complex spend category to those organizations exploring management options for the first time. We find ourselves at a most interesting time, in what I believe is the most interesting business. Now more than ever investors, entrepreneurs, and corporate clients agree: we have never seen a period when so many new industry solutions have popped up in an impactful, game-changing way and with staggering investment dollars fueling the effort. At KesselRun we review all new entrants into the marketplace to assess the potential value to our clients, and here I’ll name only a few that have caught or continued to catch our attention – great stuff for 2019! Lola is a travel booking application that combines Artificial Intelligence and agent assistance through mobile chat, meant to act as a personal assistant to travelers. Why we like it: AI applications are perfectly suited to the corporate travel space and with the power of AmEx GBT behind the technology, we think this one is here to stay and likely to pave the way for more cutting-edge AI applications. Upside is a booking application that encourages travelers to bundle trip components, follow policy, and save money through gift card rewards. Why we like it: The small to mid-market particularly among un-managed corporate clients continues to be grossly underserved. This type of service takes advantage of the industry’s new booking “realities” while providing a compelling way for organizations to assess the value of managed travel. TripActions is heavily funded desktop/mobile platform for booking corporate travel. TripActions uses AI and Machine Learning to offer personalized options for travelers that take into account policy, real-time fares and individual travel preferences. 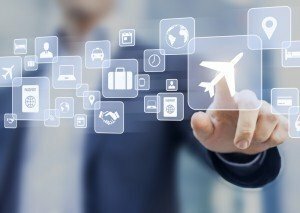 Why we like it: AI and Machine Learning will no doubt usher in a whole new perspective on how corporate travel is procured and managed. TripActions seems to be laying it all on line – generating a ton of interest through various advertising and marketing channels. We think this is the beginning of bigger things in the industry. Hipmunk is a desktop site and mobile application for booking, touted by SAP/Concur as a lightweight T&E solution for organizations to utilize before they are ready for the “full blown” Concur Expense solution. Why we like it: A sophisticated solution for the underserved small to mid-market. We have found so many organizations are intimidated or not sure if they are “ready” for traditional industry solutions – Hipmunk represents a great place for many to start and perhaps even stay. We also love the fact the solution includes newer booking channels such as Airbnb and apartment rentals. Why we like it: RocketTrip offers true gamification in the corporate travel space, a natural fit for organizations who have applied the management technique to other functional areas within the business; it also integrates with Concur Travel & Expense and provides yet another savings solution for any type of travel program. Even though we’ve seen it all, we at KesselRun are still learn something new every day. We are excited to teach people about CapTrav and promote the exciting new industry technology that will pave the way as we continue to re-define corporate travel management. What’s the saying? “Corporate Travel moves pretty fast. If you don’t stop and look around once in a while, you could miss it.” …Or something like that.